Preparation and practice is essential in learning. This obviously helps always we all know the saying goes “Practice makes perfect”. Do not let your self-defeating behavior overcome you. So let’s go say you don’t want to study. Do not let that attitude overcome you that is what leads to failure. Keep track of what you have learned. Write and keep notes in organized sections so that you may go back to them for studying. Review! Review! Review! That is how you memorize and retain information to learn and understand. Seriously! The more you see it, the more likely you will memorize it. Helping you succeed in exams. Weren’t paying attention or was absent? Catch up what you have missed so you will have the information to pass. Yeah, once again be sure to have your notes! Notes are the best things to study from for exams because they are a summary of what you have learned. Create a good study environment that is distraction free. Let’s go see, if you have a TV playing in front of you. What are you more inclined to pay attention to? The TV (obviously), so get rid of those distractions to concentrate. Be sure to have all your needed materials. Running back and forth will waste your time. Don’t you want to use the least amount of study time to retain the most information? Form a schedule that suits you. If you cannot allot some time to study… how will you pass? Unless your some “nerdy brainiac”, your going to fail. Be relaxed when studying. Study in cycles and short periods of time if it helps. If you cannot be relaxed when studying, how can you concentrate? You simply cannot. So experiment with study times and see what works for you. And finally, prioritize your work. Work on your most important to the least important. You don’t want to spend most of your time on something that was not for marks and “wing” your assignment that was for marks. See what is most needed to be done and work down to the least needed . 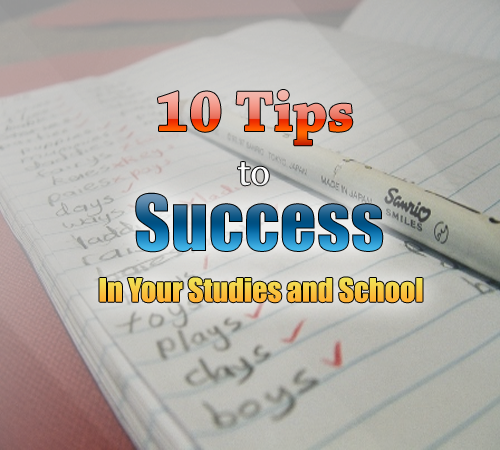 Stay tuned for my next post on “Reasons Why You Should Not Follow the 10 Tips to Success In Your Studies and School”. Have any more suggestions? Feel free to comment; I’m sure the comments are working!